Manager Lee Howells has said he is determined to take Bath City to their first Wembley showpiece, after they reached the FA Trophy semi-finals. 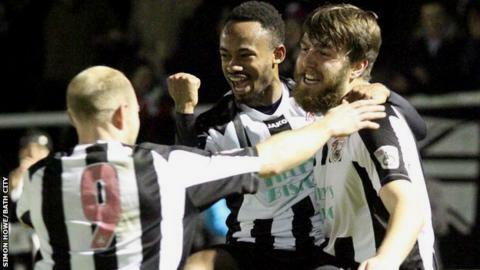 The Romans beat Conference side Dover Athletic 2-1 in their quarter-final replay on Tuesday. Howell's Conference South outfit will now face North Ferriby over two legs, with the winner progressing to the final at the national stadium. "It's what we've fought for," Howells told BBC Points West. "We've got some difficult league games coming up, and we don't want to ignore that, but we have got two semi-finals now and we want to go all the way. "After the last couple of months we've been fantastic. We've got everyone fit and available and it's now the really hard work comes." Bristol City manager Steve Cotterill was full of praise for Bath City boss and part-time barber Lee Howells after his FA Trophy exploits. "I'm really pleased for him," said Cotterill. "He's a good lad, he played for me for five years at Cheltenham. And he cuts my hair. That'll be a free one I'm getting off him now." Bath City went 2-0 up at Twerton Park after goals from Dave Pratt and Chas Hemmings, who also hit the woodwork with a free-kick. Dover, who came back from a two-goal deficit to earn a 3-3 draw in Saturday's original tie, responded with a Tyrone Sterling goal but could not find an equaliser, despite playing against 10 men for the last five minutes after Naby Diallo's sending off. "It's an unbelievable result for everyone involved," said goalscorer Pratt, after his side reached the semi-finals for the first time in their history. "We haven't had an easy run. We haven't had a lower-ranked team so to get here is unbelievable."